Mostly single track or narrow ancient caminos, this stage takes in the southern heights of the park, with stunning views over the plains to the Sierra Nevadas. The day starts as it means to go on, a tough steep ascent straight from the off, nearly an hour of "up" to get the legs going. The route climbs the old narrow roads, passing ancient secluded monasteries and remote isolated cortijos, through dark ancient forests, emerging into stunning open vistas across to the town of Quesada and to the Sierras Magina and Nevada. A short road section brings you to the trail head for the next climb, twisting and turning to gain height up the shoulder of a giant. The trail is man-made, and the amount of back breaking labour to create these ancient paths along the edges of steep gorges and ravines is beyond imagining. These ways must have taken generations to build, and they form a lasting testament to the endeavour and foresight of the ancestors that built them. These mountain sections were home to the last guerrilla activity in the Franco years following the civil war. Although the war officially ended in 1939, guerrilla activity against the fascist regime went on until the early 1950´s. 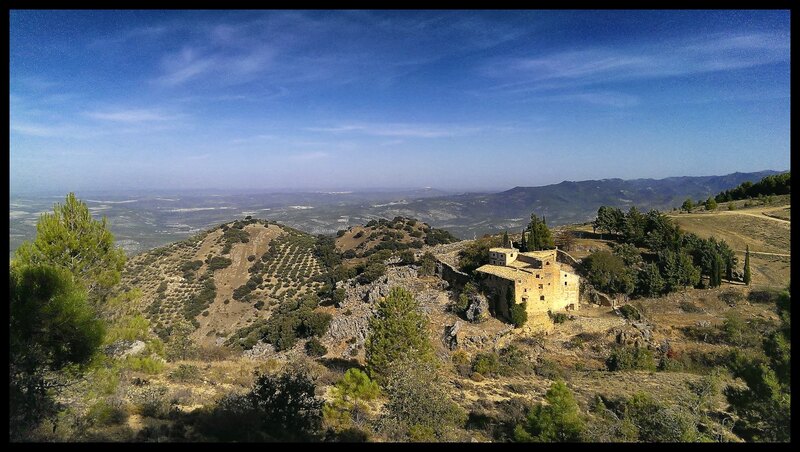 The "maquis" hid amongst these mountains, waging war against the brutal Guardia Civil. These groups, sustained by the brutalised village populations, and using these ancient forest paths to evade capture, fought on to resist until finally succumbing to starvation and treachery. These ways deserve to be preserved, respected and experienced, if only to honour the legacy of those who built them, and those who fought and died along them. The trail drops down toward Pozo Alcon via a steep and rocky section, washed out and eroded, the section does not reward the faint of heart. It requires confidence, balance, calves of steel, and the ability to let the arse of your shorts rub against the back tire. The legs and arms are pumped and burning with lactic and a safe deposit at the base is a relief. The roll out to the plains gives a welcomed breather before starting the climb to the Refugio Acero. 20k of progressive climbing along the river gorge that passes through one of the richest areas of wildlife in the park. The Mouflon can be seen, its horns a majestic display of virility and superior genes: the horns do not shed and continue to grow throughout the Rams life. Seeing these beasts for the first time is a real experience, its unclear which animal is most bemused, the sheep looking at a bike, or a rider looking at a fine set of horns. At first curious, the Mouflon stands and assesses the threat, before bolting into the undergrowth. Deer are abundant, and remarkably, they're not so timid. Spanish Ibex roam the high rocky areas, and Wild Cats (I´ve never seen, but they've been reintroduced) hunt the smaller mammals that scurry amongst the rich vegetation. 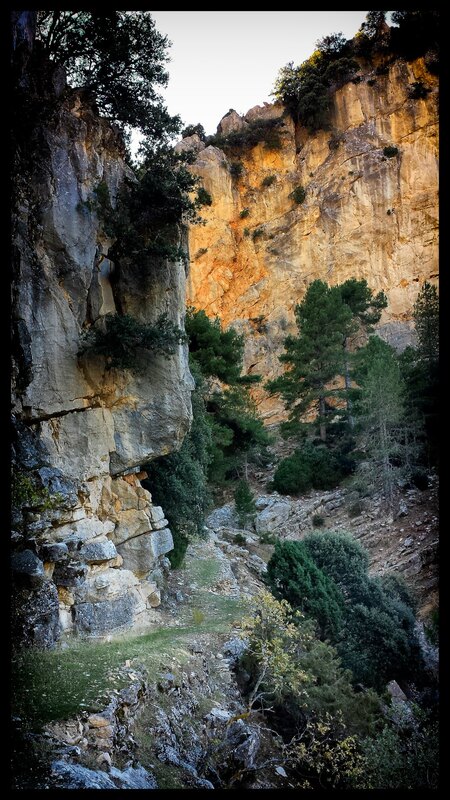 The climb winds its way up the valley, tracing the river to its source in the high limestone mountains, a crucible of 2,000m peaks and cliffs where Eagles and Vultures cruise the high limestone ridges. The section ends with a steep ramp to climb out of the valley and gain the high road and succour at the Refugio de Acero. A stunning ride through a diversity of mans history and the environment he inhabits.